What happens when there are two separate subarrays feeding the same inverter, or the subarrays are greater than 10' apart? The code doesn't clearly state how to approach this scenario. In these types of situations, Pure Power looks at the philosophy of the code and what it is trying to achieve, and develops an interpretation consistent with the intent of the code. The intent of the rapid shutdown code section is to provide an area of work for emergency responders to safely move around and conduct operations on the roof without the risk of touching an energized conductor. 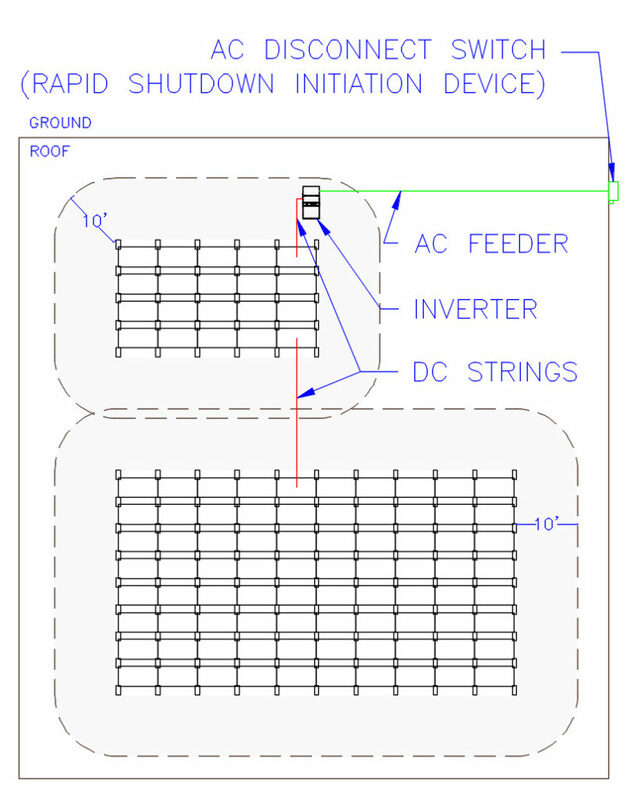 In the event of an emergency, the emergency responders can activate the rapid shutdown initiation device, then safely move around the roof knowing any areas within 10' of an array may be energized, but as long as they remain greater than 10' from a PV array, any solar AC & DC conductors they encounter will be de-energized. The first part of 690.12(1) defines the controlled conductor distance for conductors inside a building. This clearly states if you run the conductors in the building, any length of conductors over 5' is a controlled conductor and subject to the rapid shutdown rules. Less than 5' and it's not. This part is pretty black and white. This is more common in residential systems, but usually not encountered on commercial scale flat roof systems. The second part of 690.12(1) defines the controlled conductor distance for conductors more than 3 m (10 ft) from a PV array. This part applies to a majority of flat roof systems. The black and white interpretation of this part is that the conductors are not controlled conductors as long as they dont extend more than 10ft from a PV array. As such, we create a 10’ boundary around each subarray, as explained in our previous article NEC 690.12 Rapid Shutdown for String Inverters on Flat Roofs. Any conductors inside the 10' boundary are not controlled conductors and not subject to the rapid shutdown rules. What about larger systems with multiple subarrays, or multiple subarrays feeing the same string inverter, combiner box, or relay contactor? A topic that often comes up with AHJs and other industry professionals is whether you can extend a conductor from one subarray’s 10’ zone into an adjacent array’s 10’ zone. The code does not have any language stating the 10’ is from an individual array, but rather the general statement “from a PV array”. So, from a black and white code perspective, the conductor won't be a controlled conductor as long as its 10’ or less from a PV array (it doesn’t need to be a specific array). It would be nice if the code explicitly stated “any array” to avoid doubt, but we still take away the same meaning from a literal interpretation of the current language. However, let’s look at this closer and make sure this black and white interpretation isn't a loop hole that circumvents the intent of the code. If an emergency responder knows any conductors more than 10’ from an array may be energized, they can stay 10’ away from each and every subarray or PV module and be safe. In the heat of the moment, they are not going to start tracing conduits to determine which subarray the conductors start and stop in. How can an emergency responder know which subarray is the source of energization? The conductors may even be energized from both sides. There is no practical or reasonable way for an emergency responder to make that determination. Therefore, they must rely on the simple rule that any conductors within 10’ of any and all arrays will not be energized. The source of the energization, or the routing of the conductors inside that space, is irrelevant with respect to the actions the emergency responder must take. Therefore, running a conductor from one array’s 10' zone into an adjacent and continuous 10' zone is consistent with the intent of the code, consistent with the actions emergency responders need to take, and does not pose additional risk to the emergency responder. Over the years, we've had discussions on other interpretations and implementation ideas for this article of the code. Some believe the 10’ boundary should be interpreted as conductor length. We disagree with this, because the code doesn't say anything about length in part (2). More importantly the 10' conductor length interpretation doesn’t provide a realistic benefit to the emergency responder. Responders need to react quickly and focus on the task at hand, not deciphering complex implementations of the rapid shutdown rule. They are not going to start measuring the lengths of conductors to see if the controlled conductor zone is actually 5’ or 8’ from the array, as it may vary from subarray to subarray. The 10’ boundary is the worst case scenario and something responders can easily understand and react to without hesitation or distraction. As such, even if a conductor length interpretation was implemented on a system, the responders will still need to assume the 10’ zone is worst case and proceed accordingly. Therefore, we believe the 10’ length of conductor interpretation should not be used. 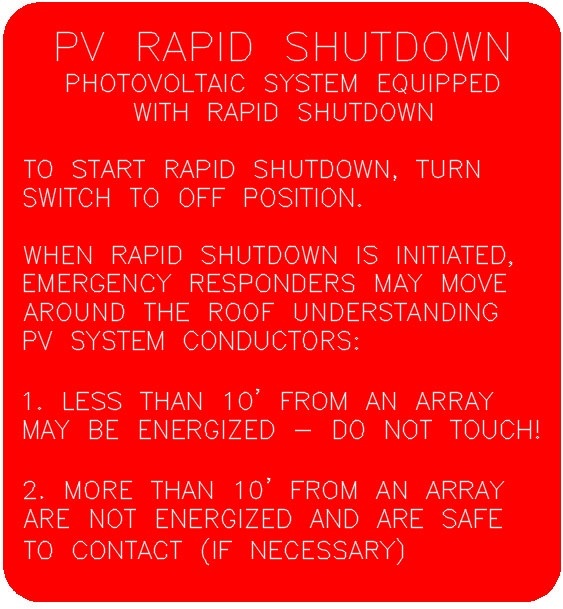 If solar professionals are confused on how to interpret the rapid shutdown code, I can only imagine how confused the non-technical emergency responders must feel. As such, Pure Power recommends that you add directions on the label. A directory label is already required to be placed on the rapid shutdown initiation device per 690.12(4), but we believe you need do to more than just call out the name and location of the main disconnect switches. To ensure the safety of the emergency responders, be sure to include directions to this label that concisely explains how to use the rapid shutdown system. I hope this clarifies things. If you have any comments or suggestions Id be happy to discuss them.